In my apartment, I like to maintain a well-stocked brewery, keeping several varieties of base malt, malt extract, and specialty grain on hand. Also, I like to buy malt in bulk to save money when I can. However, storing malt in an apartment can be tricky business as limited space is available. Additionally, when brewing small batches, keeping malt fresh over time is critical. In this Apartment Brewing Tech post, I run down some simple tips for all-grain and extract brewers alike to store malt without taking up too much space, while keeping things fresh. Cheers, and happy brewing! Storing base malt. For all-grain brewers, buying sacks of base malt or bulk grains is the low-cost option on a per pound basis. In apartment or small-space brewing, having ten, twenty, even fifty-pound grain bags hanging around isn’t an attractive option. Additionally, for small-batch brewers, tens of pounds of base malt is a lot to go through, even when brewing frequently. My typical 2.5 gallon batch uses a mere 5 pounds of grain; it took me about a half-year to go through an entire sack of 2-row. Given these considerations, storing malt for space-saving convenience as well as freshness are both key. I use a combination of two methods: extra-large freezer bags and plastic tote technology. Two gallon freezer bags are enormously useful in my apartment brewing setup. These bags hold over 10 pounds of grain and keep a nice, strong, air tight seal. I’ve been using these for many years as an all-grain brewer, and haven’t noticed any degradation to malt freshness or extract efficiency. Once stored in freezer bags, I place all of my base malt in a plastic tote at the bottom of my kitchen pantry. Any underutilized space will work, such as closets, pantries, under a bed, etc., as long as it’s dry and somewhat temperature stable, near room temperature is best. With the freezer bag/plastic tote combination, my malt stays fresh, ready for the next batch. Storing malt extract. 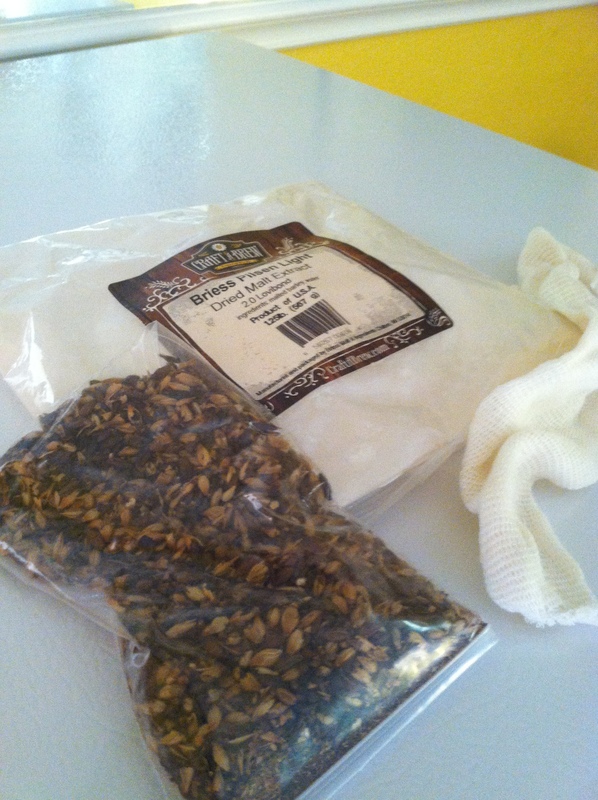 For extract brewers, the same bulk buying principle applies: malt extract is less expensive. However, with this in mind, keeping malt extract fresh is critically important when compared to base malts, as brewing grains have husks for protection and unconverted starches for long-term shelf stability. When storing liquid malt extract (LME), unused portions should be stored in the refrigerator sealed to preserve freshness and fermentability. Personally, I do not buy LME in bulk due to freshness and fermentability concerns. Instead, I buy LME as needed, and plan brew days accordingly. Dry malt extract (DME) is more stable, and can be stored more like base malt. Bulk DME or unused portions can be stored in freezer bags, and kept in underutilized apartment spaces. I store mine in the kitchen cabinets. One place I would not store DME is above the stove top where boiling water and wort occurs, or in general, any place with high humidity. DME is incredibly hygroscopic, taking on water easily, making it crucial its stored well sealed. When I was a beginner brewer, I once kept my DME above the stove top, less than properly sealed. After a long brew day, my once nice DME was a solid brick! Lesson learned. Storing specialty grains. Much like herbs and spices, I like to keep a well-stocked specialty grain collection, giving me the freedom to make just about any style on a whim. Many of the same principles for storing malt extract and base malts apply to specialty grains. Keeping specialty grains dry, away from air, stored at room temperature is the best bet for longevity. 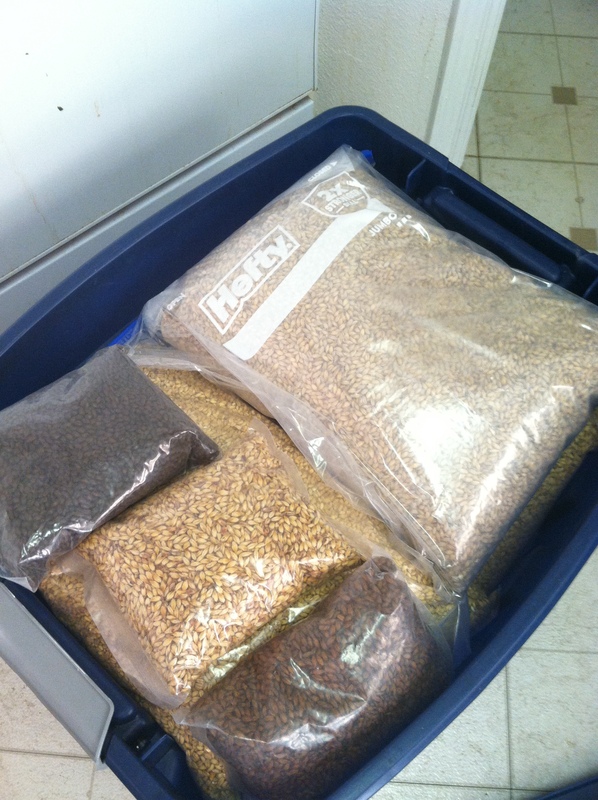 Personally, I use clear plastic containers to store specialty grains; they hold over 1 pound of grain. Since my plastic tote is overflowing with base malt, I use underutilized space on top of my pantry to store these grains. When I run out of plastic containers, freezer bags and mason jars work well in replacement. How do you store bulk grains? Leave you suggestions in the comment section below. Cheers, and happy brewing! I use pet food containers for basemalt. They have a nice, fairly air tight seal which keeps moisture and pests out. They hold anywhere from 10-15 pounds, which allows me to only have to go to the homebrew shop every couple of months. And they’re about the size of two cereal boxes put next to each other. For specialty malts, I have some nice IKEA 365+ storage container’s that hold just over a pound of grain each. I also brew 1-3 gallon batches in my apartment, and this works really well for me. Nice! I’ve seen these as well, good choice! If you’re interested, take a few pics of your malt storage tech, and I’ll post them as a reader submission to this post as well as a link to your blog. It would be nice to show a wide range of malt storage tech. Etiher way, thanks for reading! Cheers!